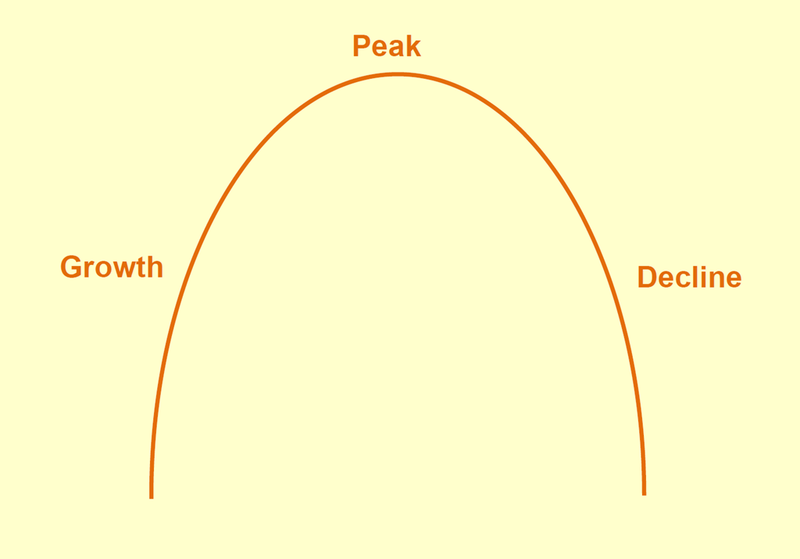 In American culture, we often imagine aging as the downhill side of a parabola, a period of decline that follows a period of peak development somewhere in middle age. When aging is framed this way, our senior years become the mirror image of childhood. The framing of aging as a second childhood includes some positive associations. Retirees, like children, don’t have to work for a living, and this freedom from work responsibilities provides time for the pleasures of play. Children and elders are also assumed to live more carefree lives, without the heavy family responsibilities that characterize the middle years of life. (Whether this assumption is true for either age group is a separate question.) Perhaps because of these similarities in their lives, children and elders are often seen to have a special kinship. But the connection of aging to childhood also carries quite a bit of negative baggage. Note that the later years of life are not seen as parallel to the early years, but as their mirror image. Where childhood is a time of growth and development, old age is a time of decline. Children are assumed to be dependent on their parents, while the elderly are assumed to be dependent on their children. Children are assumed to become more competent and independent with each passing year, but elders are assumed to become more dependent and less competent. The use of the word “cute” to describe children and elders reflects the assumption that they are not competent adults. “Cute” in this context means “clever in a way that is both unexpected and delightful.” If you’ve ever watched Steve Harvey’s show Little Big Shots on NBC television, you saw the cuteness factor at work. Harvey never took the abilities of the children on the program seriously; rather, he and the show relied on presenting them as preciously precocious and cute. Unexpected abilities in elders are similarly described as cute. “You’re still dancing at 92; how cute!” “Oh, you have a blog; that’s so cute!” We see the elderly corollary to Little Big Shots in the ubiquitous television news presentations of very old people with unusual abilities or interests as “ninety-three years young” or “one hundred years young” – a phrase that simultaneously reminds us that we shouldn’t expect skills or passionate interests in the old and reduces those skills or interests to something cute. I remember being startled when I heard one of the nursing aides in the nursing home where my mother spent the last year of her life describe her as “cute.” My mother was a formidable woman: very smart, with impressive verbal facility and a sometimes biting wit, and with a strong personality and strong opinions. There were many adjectives that I would use to describe her, but “cute” would never be one of them. She died at age 89 of a brain tumor that left her partially paralyzed and unable to feed herself, and that also interfered with her ability to communicate. But it did not reduce her intellectual acuity. I think glimpses of these intellectual skills and her strong opinions were described as cute because they were unexpected in someone who was both old and physically disabled. She knew that her intellectual abilities were no longer being taken seriously, and I suspect that is why she chose to emphasize her considerable Scrabble prowess in planning her own obituary. Framing aging as a second childhood is both inaccurate and unhelpful. Yes, many people develop some physical problems as they age and, as a result, may need help with things they could handle on their own when they were younger. And, yes, some elders suffer from dementia. But according to research on all forms of dementia available from the National Institutes of Health, only 5% of those in their seventies suffer from any form of dementia, rising to 37% for those over ninety. This means that the great majority of aging adults never experience dementia. The assumption that all our abilities and competencies are in decline as we age lowers the quality of life for elders and deprives society of their considerable skills and wisdom. It’s time to throw out this image of aging. Thanks Jean. I love reading these updates! You’re spot on. I love it! I’ve gotten hooked recently on an Australian television series called “Bed of Roses” which has some wonderfully three-dimensional elderly characters, including one with Alzheimer’s Disease. Seems way ahead of any images you’d find on American TV. I could not agree with you more! I’ve seen it. I’ve heard it. It grates on me like fingernails on a chalkboard. From clients reporting how they were treated at doctors’ offices to friends describing how their own children speak to and of them, it is nothing short of harrowing. At the risk of sounding too militant, I am reminding of Maggie Kuhn and the birth of the Gray Panthers. Is it possible to be too militant in the cause of social justice? 😉 My memory is that Maggie Kuhn was sometimes presented on mainstream media as a cute little old lady; even her militancy didn’t save her from that condescending attitude. I hate being called ‘cute.’ I can tolerate ‘dear’ because it was an endearment my mom used when referring to me but in general it’s a label people in the medical community use because they don’t know your name. I love the statistics you quoted on dementia. That means we are more likely not to end up with dementia than we are and that’s truly comforting. Oh, my…. I was once addressed by “dear” when I was only 63, in a very condescending tone of voice spoken by a doctor. There wasn’t anything in the visit that warranted it and she knew my name. Yes, you do wonder whose interests are served by giving the impression that virtually everyone will end up with dementia eventually. Thank you for the interesting framing of this issue and accompanying examples and statistics. I find it amusing to see images of old people in 1930s films. “Old” means over 50, and visual cues include being dressed in old fashioned clothing and moving about slowly. Whenever I see something that looks odd to me in these portrayals from a current point of view, it makes explicit what the underlying attitudes are. I wonder if current attitudes are much different, or whether the role of “old person” has just slid farther down the age continuum. Charlie, At a conference last year, I saw a video put out by AARP which was supposedly fighting ageism (https://video.search.yahoo.com/search/video?fr=mcasa&p=aarp+video+on+millenials+and+views+of+aging#id=1&vid=3b63f4114c3290cf51cc8e596dde3883&action=click). In it, millennials were asked how an old person would do some task (e.g., cross the street, dial a cell phone, etc.) They were then asked what age they considered old. Next they were paired up with a person older than the age they considered old; these people were all physically agile and active. After that interaction, the millennials were asked again what age they considered old. The film didn’t challenge their stereotypes about aging so much as it pushed back the age at which those stereotypes kicked in. The statistics in the study you have cited are interesting. From some of my other reading, I have read that dementia is on the rise. I note that this study was piblished over ten years ago, and I wonder if any more recent national surveys have been done? Hi Jude, I tried to track down some more recent figures. The Alzheimer’s Association seems to be pushing the narrative that Alzheimer’s Disease is on the rise. This seems to be based on projections of what will happen as the large baby boom generation ages. (In other words, the focus is not on rates of Alzheimer’s but on numbers of people with the disease.) Here is a link to their 2018 report: https://www.alz.org/media/HomeOffice/Facts%20and%20Figures/facts-and-figures.pdf. Recent scientific studies that look at all forms of dementia, however, indicate that, at least in the U.S., rates of dementia are declining and that the age at which those with dementia are first diagnosed is rising. Here’s a recent article from the Washington Post reporting on that research: https://www.washingtonpost.com/national/health-science/research-shows-that-the-prevalence-of-dementia-has-fallen-in-the-united-states/2018/06/15/636d61ac-6fd1-11e8-bf86-a2351b5ece99_story.html?utm_term=.90df9648c674. I totally agree. I don’t mind the “second childhood” as a reference to more carefree, but I do if it implies less competence. Whippersnappers!